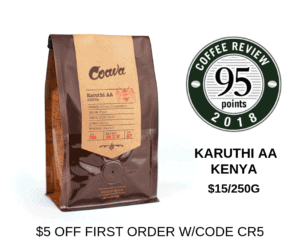 This coffee achieved the highest rating in a cupping of coffees from Sumatra for Coffee Review’s April 2019 tasting report. Coffees from the northern part of the Indonesian island of Sumatra are valued for their complex earth and fruit notes that appear to result largely from unorthodox fruit removal and drying practices called “wet-hulling.” This is a particularly refined example of the type, branded Tano Batak by the exporters, Olam specialty Coffee and produced in the admired Lintong region south of Lake Toba. Peach Coffee Roasters is an Atlanta, Georgia-based specialty roaster. Visit www.peachcoffeeroasters.com for more information. The Bottom Line: Bright and vivacious, yet resonantly deep: a Sumatra for all seasons.